If you are considering a trade in, please use the tools linked here to see the cash value of your gas savings. The gas savings can be more valuable than the voucher. A Stabenow and Harkin Cash for Clunkers bill, which replaced the original Feinstein et al proposal, has been dropped from the economic stimulus package. It is effectively moribund. See the Detroit Free Press summary here. "The proposal would have required that any new vehicles bought with the money be built in the United States, which foreign automakers said today would violate international trade agreements. Under the plan crafted by Michigan Sen. Debbie Stabenow, D-Mich., and Sen. Tom Harkin, D-Iowa, any vehicle 10 years old or younger could be traded in for $10,000. Owners would have to have family income of less than $75,000 a year, own fewer than three vehicles and have owned the vehicle they’re trading in before Jan. 16. Buyers would have to choose from new cars that get at least 25 miles per gallon and trucks that get 20 m.p.g., and the new model would have to get at least 5 m.p.g. better than the old vehicle. The trade-in would have to be crushed. " There are some attractive features to the latest Stabenow and Harkin proposal. Requiring that the cars are 10 years or younger helps reduce the junker moral hazard problem. (But sources are confusing on this point: This Free Press article states that the cars need to be at least 10 years old.) And offering up to $10,000 would help pull in highly inefficient cars that still have a high trade in value (e.g., a 2004 Yukon or Tahoe). Of course, limiting the offer to households with an income of $75,000 or less cuts out many owners of expensive inefficient cars. I'm always amazed at these stark threshhold effects in the law--going from an income of $74,999 to $75,001 drops the credit from $10,000 to $0. Why can't it be more finely graduated than that? The cash for clunkers proposal raises two moral hazard questions. One is whether people will fix up junked cars to trade in for the cash; if so, this may help the economy, but does little for reducing greenhouse gas emissions. The current Senate plan tries to minimize this effect by requiring that a car be registered for 120 days before being turned in. "Some experts counter that the rebound effect is small. For one thing, there is a limit to how much more people will drive, regardless of how little they pay for gas. (Several estimates, based on data from past fuel-economy standards, suggest that for every 10 percent improvement in fuel economy, about 20 percent of the improvement, or two percentage points, is lost because people drive more.)" The implication is that the actual carbon reduction will be close to the amount projected. For example, the move from 14 MPG to 25 MPG is projected to eliminate 3 tons of carbon dioxide over 10,000 miles; in effect, the replacement will tend to eliminate 2.4 tons of CO2 because the car owner will drive the new 25 MPG car more than 10,000 miles. That's still a big benefit in terms of GHG reduction. 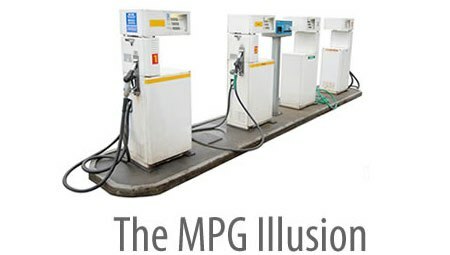 The National Science Foundation discusses the MPG Illusion in a report called "Math: What's the Problem?" and Truck Trend magazine discusses it in an article on fuel efficient trucks.